I was standing in The Whisky Exchange’s new shop in Covent Garden, London, when I noticed a Brand Ambassador standing by a small stand with some whiskey on. What whiskey? Westland Single Malt American Whiskey. That intrigued me. Firstly, because I love single malt Scotch and drink/review a lot of it. Second, because I don’t normally drink that much Bourbon or American whiskey in general. This seemed like a good go between and something different. Worth giving a try, albeit from little plastic cups. Accordingly, the reviews are quite limited. Some great info on their website, including fermentation time of 144 hours(! ), which is a lot for single malt normally. 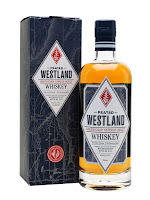 Minimum age of 24 months, but I think to be sold in Europe as ‘Whiskey’ it has to be aged at least 36? Also, they are using a combination of virgin oak/ex-Bourbon which should give less oak. Nose: Toasty, nutty, almond, hazelnut, vanilla. Taste: Toasty oak, vanilla, nutty. Finish: Medium length. More toasted oak. Oooo, like this style. Toasty and nutty, enough going on to make it interesting. The proof helps pull this off. Nose: Slight Islay peat smoke, vanilla, toasted oak. Taste: Very little peat here, more on the toasted oak and nuttiness. Finish: Medium length. A bit more peat. Currently using Scottish peat I believe, although I think they said they would start using their own peat soon? Nose: Sweet, very sweet. Sherry, maple syrup, sweet toffee. Taste: More maple, maple syrup, toasted oak. Yeah, more my style. Really nice sweet notes with the maple syrup, etc. A mix of ex-Bourbon and ex-Oloroso & PX Sherry Hogsheads and Butts.